Since 1992, the French National Forest Office (ONF) has been investing in the long-term monitoring of our forested ecosystems thanks to the RENECOFOR network the (National Network for Long-term FOrest ECOsystem Monitoring). The network was established to detect potential long-term changes in natural processes in a wide variety of forested ecosystems and to help us to better understand the reasons for these changes. 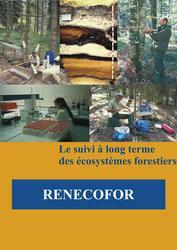 RENECOFOR is the French contribution to a much larger network of permanent plots in 34 European countries, established to monitor forested ecosystems. This long-term investment was initially a response to the forest dieback attributed to "acid rain" affecting the eastern part of France and Eastern Europe. Since 2008, questions concerning the impact of climate change and biodiversity have been added to the original focus on atmospheric pollution. The network is therefore changing to meet the challenges involved in answering these new questions. This website will allow you to discover our results from more than 20 years of monitoring in variety of fields such as atmospheric pollution, tree nutrition, biodiversity and climate. Guy Landmann, President of the RENECOFOR Scientific Pilot Committee. Georges Touzet, on the creation of the RENECOFOR network and what the future holds.